This pictures taken AFTER the extensive search by police. So, we can expect the police to leave a huge mess behind. I'm anxious to find out if that search got them some real evidence to proceed in the case.
" Bradley said. "I take good care of my kids. I keep my house clean, do their laundry....."
stains on the rug, laundry in the basket not put away & where would the baby monitor be at? the new kitten fell asleep in bed together, Baby Lisa was put in her room, she closed the door to the baby's room and her other son was in his bed. The baby monitor was on. goes to the boys bedroom and they are sleeping. where was baby Lisa sleeping? where were the boys sleeping? if there was a baby monitor where is it at? mail/letters on the floor, electrical cord plugged in along with that light plugged in and a couple of diapers on the table..............I think. Someone might be able to blow it up with resolution and see if there is a baby monitor. I suspect the baby is who was in the bed and not the boy. I just had a thought as to why she may have cut her hair: What is one of the major reasons women (mainly) opt for a makeover? A lot of times it's to mark an event like a significant weight loss or perhaps after a bad breakup. I've known many women who have changed their look after getting a new job or before going on vacation. Also, some women will alter their appearance because they don't want to see the person that they were. In DB's case, she didn't just go for a little trim, she went for a different hairstyle. So let's assume she's guilty in regards to her daughter's disappearance. I would assume that she would not want to look in the mirror at "that person" anymore. "That person" who is guilty of something. I know this sounds like psycho-babble, but women really do change their looks when they are uncomfortable about something they've done. Just as they change their look when they are happy about something they've done. JMO and just another of my kooky theories. Not 'kooky' at all - In fact I think it's right on! KANSAS CITY, Mo. (AP) - The reported sightings have come from as far as California, people just certain they've spotted the blond-haired Kansas City baby whose cherubic face has been printed on fliers and circulated on national television programs since her disappearance three weeks ago. Yet so far, the some 200 calls fielded by Kansas City police have only generated a string of false positives in the search for Lisa Irwin. The problem, officials say, is that at her age - just 10 months when she went missing on Oct. 4 - countless babies match the same description, right down to the bright blue eyes and two bottom teeth. She does have a distinguishing birth mark on her right thigh, but that would hardly be noticed from a distance. So we are at 3 weeks in and nothing? More stories and sightings and men in the woods? This is getting crazy and it looks bad for Baby Lisa. 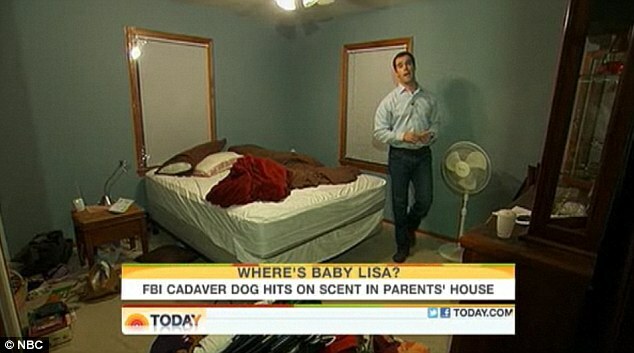 I wonder what the cadaver dog hit on exactly --- on the floor near the bed. Not the actual floor? It creeps me out to think about this but the lady who owned my home before me died in the house. So, 11 years later and the flooring has been removed down to subfloor and replaced .. I wonder if a cadaver dog would still get a hit in that room? Another day and another prayer for Baby Lisa to come home. Another reason someone in this situation would change their looks....so that potential witnesses couldn't positively identify them. I think that is a baby monitor on the little table. JVM is also showing pics of the bedroom and where the cadaver dog hit which is on the left side of the bed in front of a night stand (if you are standing at the foot of the bed facing it). Hopefully we can get a screen shot of those pics. Got a shot from the video at this link. Peter Alexander indicated this is the area where the dogs hit. I vaguely remember a case with a missing child where the mom had a makeover afterward. It seemed extremely inappropriate then. It's the same now. Who would be thinking of doing her hair at a time like this. Frankly, I don't think I'd be taking the time to bathe much less sit and let someone do my hair. I am thinking of Misty Croslin Cummins and her "granny." I don't know how long Misty's lasted after she quit getting the networks to pay for her interview "look". She has definitely lost it now after being in jail for a year, but look what she has gained! Are these nutcases fed "stupid" pills, or do they take them voluntarily ? Whoaa!!!! I think Cartfly meant that as a joke, not to be taken literally. Next we will hear it on Nancy Grace as a fact. Yes, Cartfly. In every picture of Lisa, she looked healthy, happy and clean, well dressed. She was obviously a child who was well taken care of. It is baffling. I checked with NOAA and the low temperature on Oct. 2 in Kansas City was 41 degrees, quite chilly. Much too cold to be carrying a baby dressed only in diaper. To me the thought of someone just willingly helping Deborah get rid of a dead baby is mind boggling. I have no friends or family who would help me do a thing like that and I doubt that many people do. In fact, my family would probably have me committed. The thought of walking around for a couple of hours carrying a dead baby is equally mind boggling, to the point of not possible. One night Nancy Grace said that the going price for a baby was $80,000 in New York. I hope that if Lisa were taken by a stranger, it was for this purpose, that she is alive and well and being taken care of by people who were desperate for a baby. And I hope she is returned to her family. You are correct in that it seemed the brothers adored her. In fact, it seemed that her mother and father did, too. Once in a great while you hear of a baby being kidnapped, raised as their own child by strangers, and only finding out about this as an adult. But I know that sometimes things are not as they seem. I pray she was taken by someone who will see that she's taken care of. She is a beautiful, charming baby and deserves so much. I hate to state the obvious, but caylee anthony appeared happy, healthy & well dressed. She also appeared loved & happy in pics with kc. However, there is NOTHING anyone could tell me that would convince me that kc did not kill her child. I will never know if it was intentional or accidental, but I do know that even though she might have appeared to love her child to anyone that knew her, she clearly did not. Accidents happen to children,but normal people dont cover them up unless they r cold &heartless. If it is proven that this mother is innocent, I will eat crow, but I dont think it will happen. At the very most, we all may be left forever wondering. I dont think a kidnapper will be found tho. You're right. Caylee appeared healthy, happy and clean. However, that wasn't Casey's doing. That was done by Cindy, who fed, clothed, bathed, and did everything for Caylee. Casey didn't even have a job to contribute financially to Caylee's wellbeing, even if she wanted to. Apples and oranges. You won't need to eat crow if Deborah is found to be innocent. We are all entitled to our opinions and that's yours. I don't see definitive evidence that Deborah harmed Lisa except by neglect. I do not believe that she harmed Lisa. That's mine. Is that a little camera above the door? JMO - A 10 month old sleeping in a bed(w/no frame) with a parent is as likely to be smothered by the parent as a stranger coming into that same house and taking a baby. Statistics support that both of these are highly unlikely. I agree. It *might* be slightly riskier for a newborn, but by the time a baby is 10 months old he or she is big enough to wiggle around and find a way to breathe. The front door? Maybe not working at the time? 12:15 AM: Witnesses observed a man wearing dark pants in the Irwin/Bradley neighborhood carrying a baby. 02:30 AM: A gas station video capture a man wearing white not carrying a baby. 04:00 AM: A witness observed a man 3 miles away from the Irwin/Bradley residence carrying a baby. Could it be that the gas station video is not case related? When the words of the witnesses are considered in regards to description ... could the male observed carrying a baby have been Jeremy Irwin? UNIDENTIFIED FEMALE: We couldn`t really tell the race at that time. It was dark and the lighting out there isn`t very good to tell somebody`s race. But we were able to see that he was kind of taller. I would say at least 5`8 or taller and he was really slender. He was wearing like dark- colored pants and what we believe was a t-shirt, like a white t-shirt. Surveillance footage of a mystery man leaving a wooded area on the night of baby Lisa Irwin's alleged disappearance nearly three weeks ago was located at a gas station in Kansas City near Deborah Bradley and Jeremy Irwin's home. The security camera shows a man dressed in white leaving the woods at 2:30 a.m. just two miles from baby Lisa's home.